Russia's President Vladimir Putin (L) and Russian Foreign Minister Sergey Lavrov arrive for a meeting with Russian ambassadors and representatives to international organizations in Moscow, on July 19. Putin and President Donald Trump have attempted to improve their countries' strained ties, but the Republican leader has faced a backlash at home. SERGEI KARPUKHIN/AFP/Getty ImagesLavrov's remarks came at a complex time for U.S.-Russia ties, which have in recent years undergone their most difficult period since the collapse of the Soviet Union and the subsequent end of the Cold War. President Donald Trump has sought to work with Putin to restore the two leading powers' relationship, but has been hit with significant criticism for his efforts, especially due to persistent allegations that Trump's campaign colluded with Russia in an attempt to secure a victory in the 2016 presidential election. Keep up with this story and more by subscribing nowAfter Russia's 2014 annexation of the former Ukrainian territory of Crimea, Congress passed a law prohibiting any formal ties between the U.S. and Russian armed forces. Despite Trump's efforts to secure a dealthat would see Washington and Moscow work together to return refugees displaced by the Syrian conflict, an extension of this ban was included in the 2019 National Defense Authorization Act, which is likely to be passed sometime this week, Politico reported. Still, senior U.S. and Russian military officials have occasionally sat down together, including U.S. Joint Chiefs of Staff Chairman Marine Corps General Joseph Dunford and Russian military General Staff Chief General Valery Gerasimov. The State Department declined to comment on Lavrov's remarks when reached for comment by Newsweek, but the Pentagon said conversations between the heads of the U.S. and Russian militaries "have been ongoing for purposes of military deconfliction." "The president has said he believes a better relationship with Russia would be good for both America and Russia, but the ball is in Russia’s court. The meeting in Helsinki is the beginning of a process between the United States and Russia to reduce tensions and advance areas of cooperation in our mutual interest. As President Trump stated, the two sides agreed that their national security council staffs will follow up on the presidents’ meetings, and these discussions are underway," a Pentagon spokesperson told Newsweek. 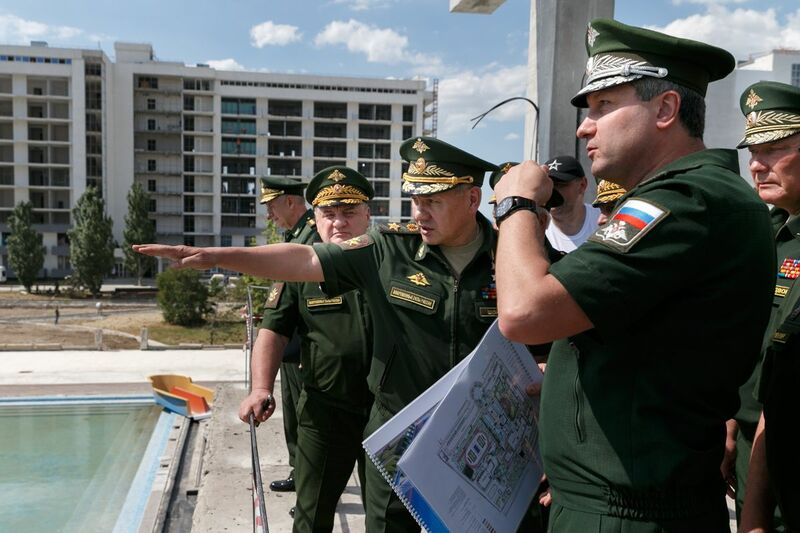 Russian Defense Minister Sergei Shoigu gestures during a visit to the Southern Military District, June 19. Defense Secretary James Mattis has reportedly expressed a willingness to restart talks with his Russian counterpart. Vadim Savitsky/Russian Ministry of DefenseDefense Secretary James Mattis himself reportedly told journalists Friday that he would be willing to restart a mil-to-mil dialogue. "I am considering meeting with my counterpart, but there’s been no decision," Mattis told reporters in an off-camera setting, according to Breaking Defense, adding that he was "all for re-opening communications" with Russia given the right circumstances. "It’s most important that we talk with those countries we have the largest disagreements with," he said. Russia has accused NATO of militarizing just across its borders, especially criticizing the deployment of advanced, U.S.-built anti-missile systems. Moscow has portrayed these defenses, along with other high-tech systems deployed in the Asia-Pacific region as a missile shield designed to mitigate Russia's warfighting capabilities.